An officer with Georgia's Alpharetta Police Department resigned on Friday, just one day after an internal investigation was launched into the officer's behavior during the arrest of a 65-year-old grandmother. The officer's resignation letter was posted on the department's Facebook page with a note from Police Chief John Robison stating that, regardless of the resignation, the investigation into the traffic stop arrest would continue. "I did what was necessary to complete the arrest by raising my voice and using verbal commands, using heavy control talk with profanity. It worked instantly and she exited the vehicle immediately!" Officer James Legg's resignation letter reads. "Maybe I should not have used profanity, but its immediate effectiveness is not questionable and I do believe I acted reasonably under the circumstances." The letter went on to state that Legg left the department because he felt that he would not get a fair investigation, as Robison had already taken to Facebook on Thursday and deemed his actions "inappropriate" in a post attached to the dashcam video. 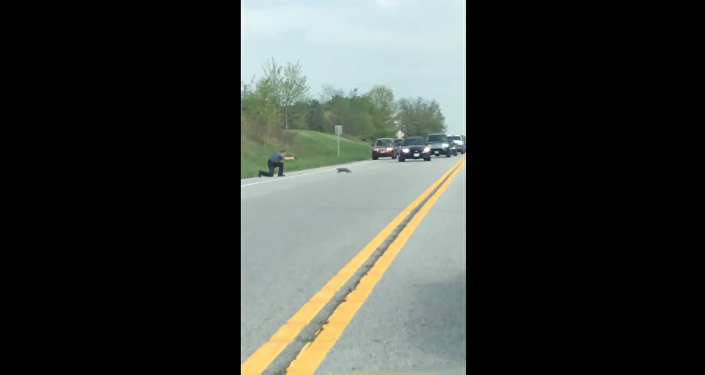 The footage that Robison released shows the May 4 traffic stop of 65-year-old Rose Campbell, who was pulled over for failing to stay in her lane. An altercation between Campbell and the officer who pulled her over ensued after she refused to open her door and step out of the vehicle. With the officers unable to remove Campbell from the car, the recording shows Legg, sporting a baseball cap, running toward the side of the car and entering through the passenger seat to turn off the car. Seconds later he makes his way around the car and begins to yell at Campbell. "Hey, you're not in charge. Shut the f**k up and get out of the car," Legg is heard telling the Campbell as two other officers try to remove her from the car. "Shut your mouth." As Campbell repeatedly yells out for a supervisor to be on the scene, dashcam footage shows Legg forcefully pull on the 65-year-old. The video ends with officers asking Campbell to sit inside the responding officer's car. Recalling the events of that night, Campbell told Atlanta's Actions News that she "didn't expect that in America." "I didn't expect that especially in Alpharetta," she added. Robison later told the station that he'd immediately suspended Legg and ordered an internal investigation after being informed of the incident. In addition to the investigation being launched by the department, the Georgia Bureau of Investigation, an independent agency providing assistance to the state's criminal justice system, will also be conducting a probe on the matter.